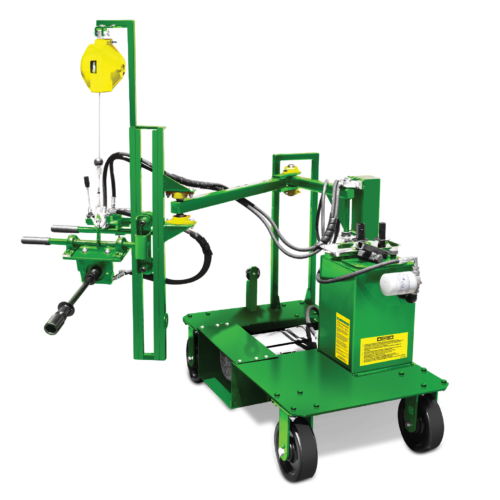 The Electric over Hydraulic powered WORKMASTER® Wellman TO-E02-MP Mobile Position Bulk Trailer Trap Opener features a motor-mounted 4 wheeled base for unloading site characteristics that require maneuverability up and down the unloading zone. Unloading sites with above average productivity which require rapid opening / closing during continuous movement unloading. Precision machined, 1-piece construction adapter fittings come standard to fit all Timpte, Wilson, Merritt, and Corn Husker trailer traps! Ergonomically positioned, height adjustable drive fitting & speed control throttle. Manual-regulating, no torque-reaction dual torque output of 150 and 250 ft-lbs to open even the most jammed trailer traps.